These rich, decadent, and chocolatey Oreo Mousse Cups are the perfect green treat to serve at your St. Patrick's Day party. 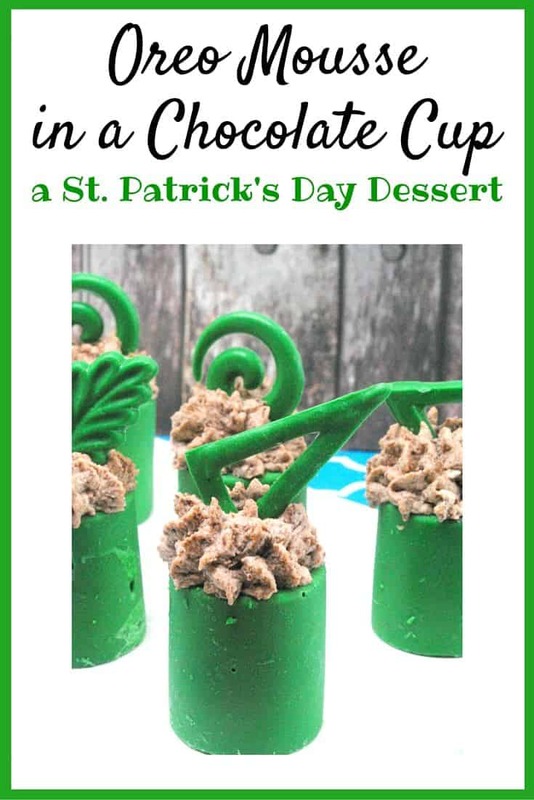 I think that the chocolate topper pieces gives these Oreo mousse cups a nice finishing touch, but you could easily omit the chocolate accent pieces on top of the cups and use green sprinkles or a shamrock decoration instead. A perfect St. Patrick's Day Dessert Recipe! 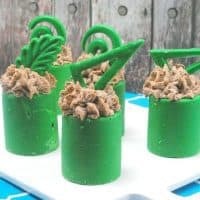 These rich, decadent, chocolate Oreo Mousse Cups are the perfect green treat to serve at your St. Patrick's Day party. Pour the candy melts into the top half of a double boiler. Heat water in the lower half of the double boiler over medium heat. Stir until chocolate is melted. Remove from heat. Add Creme de Menthe Flavor. Stir well. Add green gel food coloring, stirring well until the designed shade of green is achieved. Carefully pour the melted chocolate into the mold(s). Place in the freezer for 2 hours or until firm. 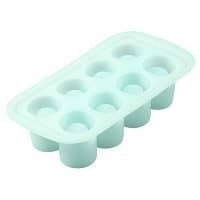 Remove from the freezer and carefully remove from molds. Set aside. Add egg yolks, powdered sugar and ⅓ cup heavy whipping cream together in a medium saucepan on low. Whisk constantly until it begins to thicken almost doubling in size. Begin to add the chocolate wafers while removing from the stove top. Continue to stir until the chocolate has completely melted. Stirring often, allow the chocolate to cool to room temp. Using an electric mixer, beat the rest of the whipping cream until stiff peaks form. Slowly begin to whisk in 1/4 of the whipped cream into the chocolate custard until it lightens. Then, gently fold in the rest of the whipped cream. Add crushed Oreos, stirring to mix well. Add 1 tablespoon of milk (at a time) if the mousse is too thick for piping. Spoon the mousse into a pastry bag with a large tip. Fill each cup with mousse, working in a circular motion. 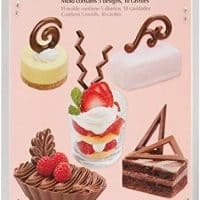 Place chocolate accent piece on top of each cup and refrigerate until ready to serve. Wow these look amazing! Almost so pretty to eat… Almost lol. Thank you for sharing. Thanks for this recipe from an English woman and her Welsh mother living in Ireland! This dessert sounds like a winner. Could you please make all the text on your page a darker color? I’m having trouble reading the light green text on the giveaway right side . Also the white text on your banner is hard to read for me. Grandkids do not like chocolate, but I can get them to eat some white chocolate. This would be prefect for them. Thank you for sharing! This sounds wonderful! I’ve bookmarked it–thanks for the recipe! This is the cutest St. Patty day treat that Ive seen! This really is a good looking & yummy looking dessert. Thanks soo much for sharing! 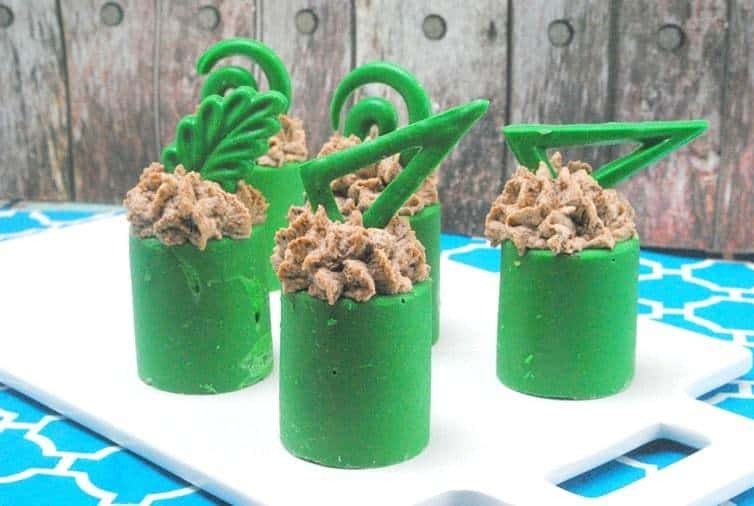 If I can find some St. Patty Day molds, I am for sure making this for my cousin’s birthday. Her birthday is St. Patty’s Day. And we love mousse. YUMMY! Talk about YUM! This Oreo Mousse in Chocolate Cups looks amazing AND fun to eat! These look fantastic! I’d make them for just about ANY occasion! This is a great recipe. We will tweak it a little for other occasions too. That’s a beautiful looking dessert. Probably get pinned to an ‘fail’ for me. on St Patricks Day so I am looking forward to making these for her next bday! I’ve wanted to try to make chocolate for awhile. Thanks for the recipe. My sister will flip for this recipe! She loves decadent desserts, especially with white chocolate. I love creme de mint so that drew me in. My favorite part is the toppers-they are so elegant.